The Gassy Gnoll has come to an odd realization recently. He doesn’t like book bloat. What is “book bloat” you ask? 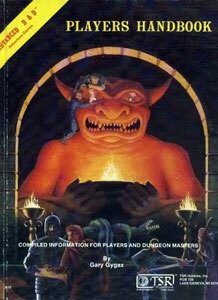 Way back when dinosaurs roamed the earth, I started playing AD&D 1st edition in 1982. The first book I had was the 128-page hardcover Player’s Handbook (PHB). It was 128 pages offering everything I needed to create all the classic classes including clerics, fighters, rangers, paladins, magic-users, thieves, and monks. After that I ended up with copies of the Dungeon Master’s Guide, the Monster Manual, Fiend Folio, Deities & Demigods and hordes of others. But the PHB started it all for me and did it all in 128 pages. What I realized recently is that the PHB’s 128 pages is the standard by which I approach every other game. If it has more than 150 pages some part of my brain screams that it’s too big. Some of this is probably due to my conversion in recent years to supporting the rules-light movement. There’s something to be said for rules you can boil down to 50 pages or less and still get a great game going. But books like Paizo’s Pathfinder Roleplaying Game Core Rulebook weighing in at 576 pages and Crafty Games’ FantasyCraft at a hefty 402 pages scare me. These are books you could just as easily use as weapons in hand-to-hand combat as tomes for the illumination of game rules. of the PFRPG Core book amounts to less than 1% of the paper from your average tree. But if I bought 174 copies of the printed book, that would be about the right number of pages. And at 1.2 inches high, that stack of books would only be about two stories high at 17.4 feet.But it’s a bit intimidating looking at a huge book as a beginning roleplayer and wondering how you’re going to figure it all out. Most board games only come with a little pamphlet explaining the rules. Getting one of these huge books is more like getting a college textbook than a game book. And then when you buy more than one big hardback (or paperback), it gets even more impressive when you try to haul them all around. Instant muscle-building for geeks! That’s why I’m a bit more enthusiastic about efforts from Wizards of the Coast and Paizo Publishing putting out box sets for Dungeons & Dragons, Fourth Edition (4e) and the Pathfinder Roleplaying Game (PFRPG). The Paizo boxed set includes a 64-page Hero’s Handbook for players and a 96-page Game Master‘s Guide, plus tons of pieces, character sheets, dice, and a map. And the 4e set includes a 32-page book for players, a 64-page book for DMs, plus assorted other bits. These are products I can get behind as someone not trying to scare the crud out of a new player. I’ve done my time in the trenches with the old school games of yore hauling around duffel bags filled with heavy books. I still enjoy going to my local game store and perusing books of monsters, setting information, and spells to get inspired. And I still enjoy playing D&D, Pathfinder, or whatever else presents itself. But I find these huge books to be more of a burden (physically and mentally) than some of the rules-light games of today like Warrior, Rogue & Mage. And I have hope for FATE- or GUMSHOE-based games as well. Am I the only old fart seeking simplicity to go with his graying and thinning hair? The book size matters more to the size of the publisher that is undertaking the task. A larger book is a more significant time and resource investment for a small company publisher. On the other hand, Paizo and WotC have access to significantly more resources to make it happen in a timely fashion. I suspect Paizo and WotC are attracting new gamers to their systems just fine even prior to releasing box sets to speed up entry. As far as a player goes, for a DnD 3.0/3.5/Pathfinder character all you really need to look at is races, classes, stats, skills, feats, and maybe a handful of spells to start a beginning character. That’s a fraction of the Player’s Handbook or Paizo’s Core Rulebook for Pathfinder. I can see the argument that price might weed out some buyers for a book. Then again, Skyrim (the computer game) is likely more expensive than Paizo’s core rulebook. Limited money and/or time to read might influence one’s preference on this topic, but I suspect there are a lot of gamers out there that are fine with the size of books.